If you need wipes, grab this cheap deal on BabyGanics hand and baby wipes on Amazon! As low as $35.64, so just $1.98 a pack! This is an awesome price for these huge packs of wipes made from plant-based ingredients! 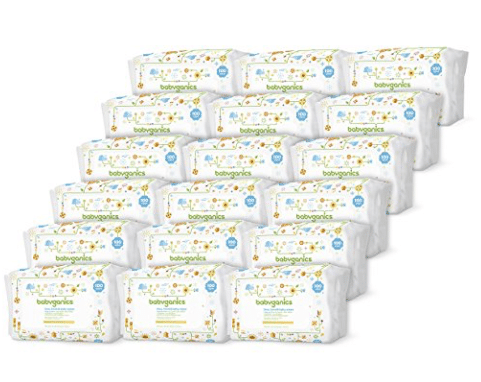 And, don’t forget, you can save up to 60% off BabyGanics chlorine-free diapers when you combine the below 40% off coupons with the 5-20% off Subscribe and Save discount! Just FYI on the diapers , they’re still about .29 each and seventh generation is comparable in quality but usually has better deals. The BG diapers also run about a size smaller than pampers for reference. Size up if you’re not sure. Last, the wipes are great for bottoms but my daughter and I both had allergic reactions when using in our faces. Once she was about 5-6 mo and I needed to wipe baby food off her etc , I switched to seventh generation which are thicker and we didn’t have allergies to them. Thanks for the info Rian! !